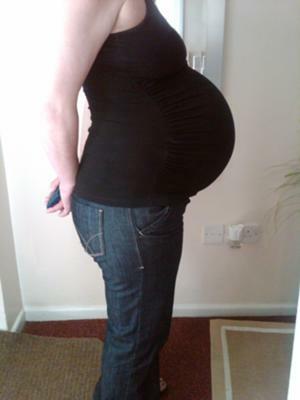 Here the headless woman photo at just over 33 weeks, my husband thought my head wasn't important, its all about the belly!! Worshipping the bio-oil still, no stretch marks yet. Struggeling now everything is a real effort, even trying to do nothing! you look lovely, just all baby, a nice designer bump. kind of quess when your husband didn't include your head he was focussing just on his babies. good luck. Thanks for your comments ladies. 35 +5 weeks now, and counting down - I have no patience just want to meet them! Good luck with your pregnancies. Wow, your belly looks great... perfectly round! And I'm sure your face is pretty too! I think I know what you mean.. late in pregnancy with my girls I was too anxious to sit still - I couldn't do nothing! On the other hand I was so big and slow that any chore was difficult and exhausting. My husband suggested I relax by writing to friends and family, because it was not strenuous and I could use my giant belly as a desk! He was teasing me, but I did try it and it helped a bit. I wish you the best with little him and her... they'l be here before you know it!